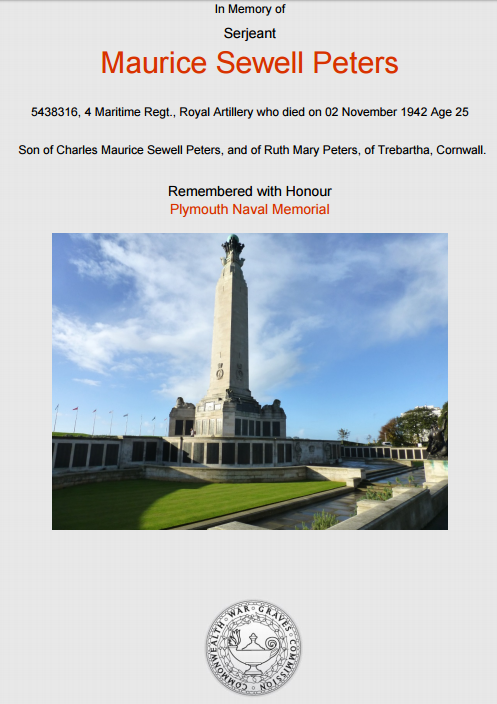 Serjeant Maurice Sewell Peters 5438316 Royal Artillery 4 Maritime Regiment was lost at sea in the North Atlantic whilst aboard the merchant vessel Empire Gilbert when it was torpedoed by a U-Boat on 2nd November 1942. The story that connects him with North Hill begins with his Devon born parents, Charles Maurice Sewell Peters and Ruth Mary Peters nee Reed. Charles was born in 1888 in Dawlish and his wife, Ruth, was born around the same time in Ottery St Mary. Ruth's father was a postmaster and was appointed in that role in Dawlish. This was most likely where Charles met Ruth but both families moved away from Dawlish threatening the relationship. Charles' family moved to Ilford in Essex, close to London, where Charles worked as a stockbroker. Ruth's father was later appointed as postmaster in Launceston and he took his family to live in Pendennis, a house at Tamar View on Tavistock Road in Launceston. 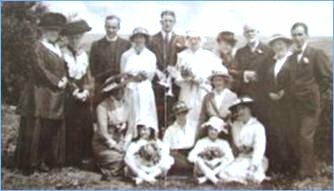 The miles seem not have impacted upon the relationship of Charles and Ruth and they married in the large Wesleyan Chapel in Launceston on 8 July 1916 before setting up home in Ilford. The marriage group photo shows Charles Peters as the tall man at the back. Ruth is standing in the centre of the group. The photograph was annotated; click on the image to see a large, uncropped version. (Photo courtesy of John Pitts). Ruth became pregnant with their child in September 1916. A short service attestation survives which shows that Charles had taken the loyal oath before a magistrate on 6th December 1915 and had been placed in the reserve. 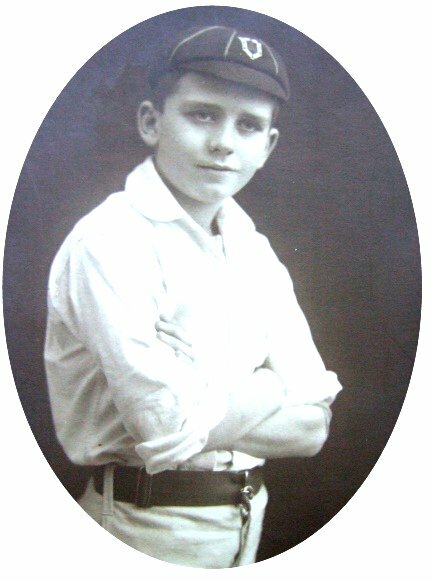 Charles was mobilised from the reserve and posted to the 1st Battalion of the Honourable Artillery Company (which tended to attract men from stations in life which were somewhat more elevated and Charles was a stockbroker and a manager) on 14th November 1916 at the Warley Depot in Essex, as Private 9403 Charles Maurice Sewell Peters. He was trained and sent to France on 1st March 1917 to fight on the Western Front. His service record shows that he was an infantryman and this would have placed him in the trenches on the front line. The list of WW1 casualties published by His Majesty's Stationery Office shows that he was present at the Battle of Arras. On the 17th April 1917 Charles suffered a shrapnel wound to his right hand and another to his left arm which was broken. He was taken to the 1st Canadian Casualty Clearing Station, the record for which shows on this day that Charles was transferred #12 Ambulance Train. He was taken by this to #18 General Hospital at Camiers on 22nd April where his list of injuries was extended to include a gunshot wound to the head, another to the right leg and that his left arm was amputated. Charles died of his wounds on 22nd April and was buried at Etaples Military Cemetery, pictured here, south of Boulogne in Northern France. Having learned of the fate of her husband and despite the fact that she had her husband's family around her in Ilford, Ruth returned to her own family in Launceston to have the baby. Ruth gave birth to her son Maurice Sewell Peters on 9th May 1917 at home in Launceston and on 4th July 1917 Charles' meagre personal effects were sent there. Ruth received £2 6s 2d from Charles' pay and £3 war gratuity. From October 1917 she received a pension of eighteen shillings and nine pence per week for herself and her child. On 26th May 1922 Ruth acknowledged receipt of Charles' medals, the British War Medal and the Victory Medal. This was from her home in Plymouth. In the 1920s Ruth's father was the postmaster in Boyton, a few miles north of Launceston; the family lived at The Beeches in Boyton. A local man was William Knowles whose life had been spent dealing with trees, sawing and wood products. Ruth and William married in 1926, providing a stepfather for young Maurice who was 9 years old at the time, the first father he had known. William's skills in handling wood were to provide him with long term employment on the Trebartha Estate. The story of William's recruitment and working life at Trebartha is recorded in The House By The Stream by Bryan Latham and extracts from the book relating to William can be seen on the Trebartha page on this website. 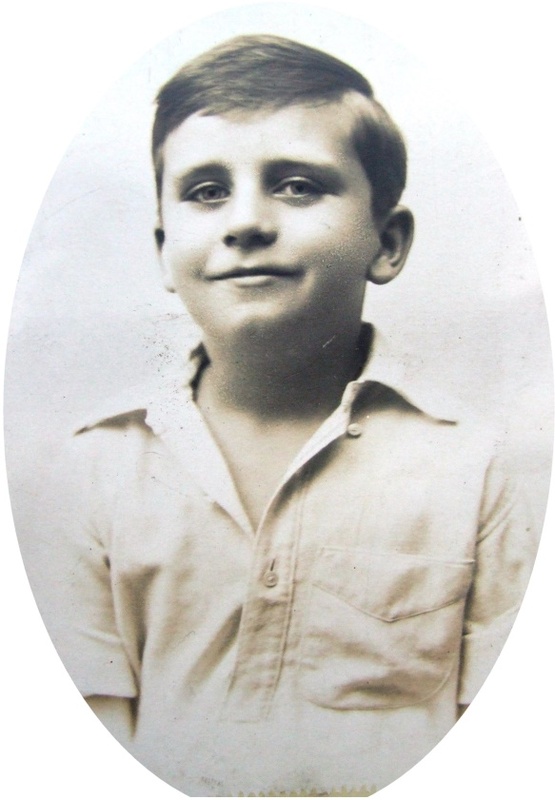 Maurice is pictured as a boy in the two oval photographs, courtesy David Pitts. Maurice enlisted into the Duke of Cornwall's Light Infantry as an artilleryman. He transferred into the Royal Artillery which was his regiment at his death. 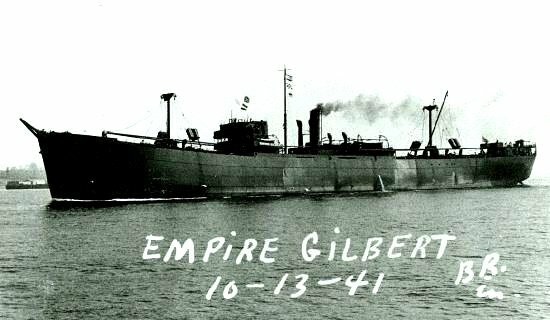 On 2nd November 1942 Maurice was a gunner on the merchant vessel DEMS (Defensively Equipped Merchant Ship) Empire Gilbert. She was en route from the River Tyne to Archangel via Loch Ewe and Reykjavik, carrying war materials, including tanks and aircraft. Having left Reykjavik and on the final leg of the journey the ship was sunk 275 miles north of Iceland (70° 15'N, 13° 50'W) by torpedoes from the U-boat U-586 commanded by Dietrich von der Esch (pictured here). At 01.18 hours on 2 Nov 1942 the unescorted Empire Gilbert (Master William Williams) was hit on the port side by two torpedoes from U-586 and sank within 2 minutes southwest of Jan Mayen Island. The U-boat had chased the ship for about two hours and missed with a first spread of two torpedoes at 00.17 hours. The Germans arrived at the sinking position after 30 minutes and rescued two men (deck boy Ralph Urwin and gunner Arthur Hopkins) sitting on a beam in the ice cold water, who were already unable to move and had to be lifted aboard. 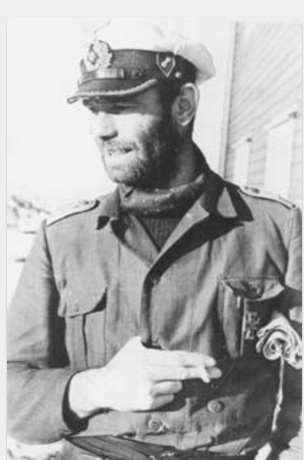 Von der Esch then tried to question six survivors on a raft but received no answer, so he took another man as prisoner aboard, the gunner Douglas Meadows. They took care of the survivors and landed them at Skjomenfjord, Norway on 5 November. The master, 46 crew members and 17 gunners (the ship was armed with one 4.7in, one 40mm, four 20mm and eight Twin Marlin machine guns) were lost. Douglas Meadows was a colleague of Maurice Peters. Douglas' recollections of the voyage were published in the book Arctic Interlude: Independent to North Russia by Harry C Hutson. The whole book can be seen on Google Books and Douglas' recollections can be seen on pages 194 to 196 and they make excellent reading. An extracted image of the pages can be seen here. Ruth had lost her husband in World War One and her only son in World War Two. 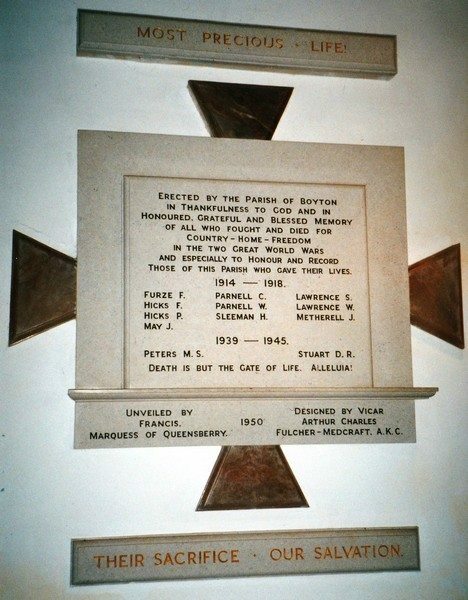 Maurice is remembered on the memorial in Boyton Church (photograph courtesy of Gary Lashbrook) and on the Plymouth Naval Memorial.